I’m seeing short-term uptrends for EUR/JPY, GBP/JPY, and EUR/GBP these days, with a couple showing potential retracement setups and the other waiting for a breakout. This pair was off to a roaring start this year as price cleared yet another upside barrier at the 135.00 handle. An ascending trend line can be drawn to connect its lows since mid-December and a pullback to this rising support area might be due. Stochastic is on the move down to show that euro bears have the upper hand while bulls are taking a breather. Buyers could return once the oscillator hits the oversold region and turns back up. Applying the handy-dandy Fib tool on the latest swing high and low shows that the 50% to 61.8% retracement levels are in line with the trend line and a former resistance zone. ECB member Coeure’s hawkish remarks were mostly responsible for the shared currency’s ascent last week, and the upcoming medium-tier reports from the region’s top economies could make or break the rally. Guppy is also on a tear and is cruising inside an ascending channel on its short-term time frame. Price is hitting the resistance, though, and stochastic has been indicating overbought conditions for quite some time. With that, the pair could retreat to the bottom of the channel near the 152.50 handle or the mid-channel area of interest around 153.00 where buyers might be waiting. 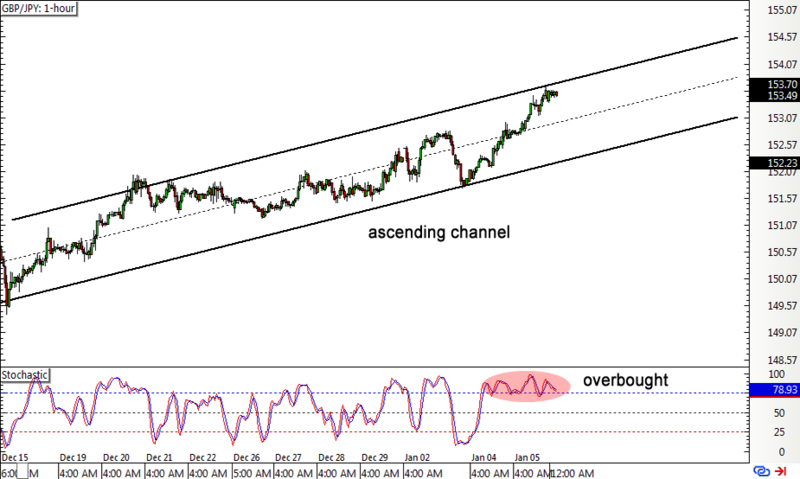 But if pound bulls are eager to charge, the pair could bust through the top of the channel and stage a steeper climb. As Pip Diddy noted in his GBP Weekly Review, sterling has been drawn strength from reports that PM May is looking to strengthen their Brexit position early last week then from the upbeat services PMI later on. U.K. industrial production data is on the docket this week. 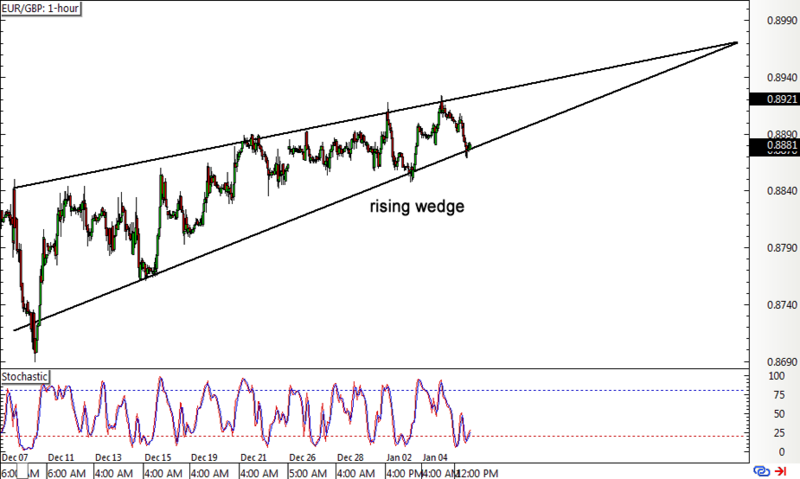 EUR/GBP has formed higher lows and higher highs, consolidating in a rising wedge pattern on its 1-hour time frame. 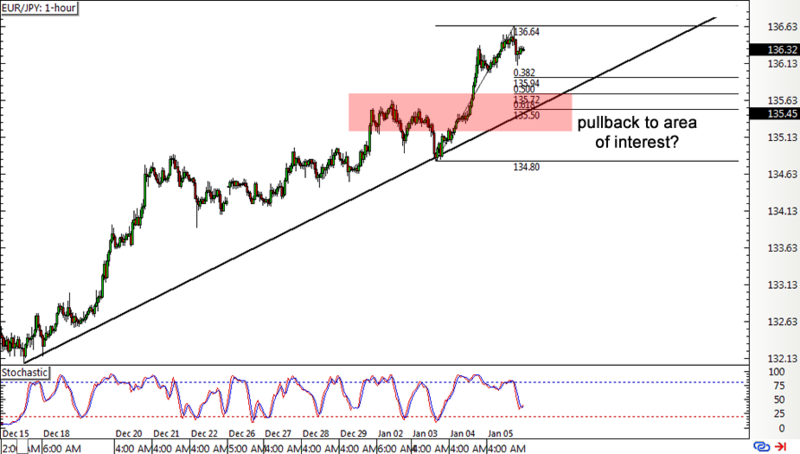 Price is currently testing support while stochastic is moving up from the overbought area, so a bounce might be due. This pair could keep pacing back and forth between support and resistance, with a potential breakout looming as price approaches the peak of the wedge. Note that this chart pattern spans around 200 pips in height, which means that the resulting breakout could be of the same size. In terms of fundamentals, the euro might retain its edge against the pound in the coming days since it has more catalysts lined up. Of course if those reports fall short of expectations, the U.K. currency could still have a shot at taking the lead.